Steve Wozniak is, of course, one of the two Steves that founded Apple, and the one that did all the technical work. The guy that soldered a 6502 and a bunch of other chips together into a computer that essentially started the personal computer revolution. More recently, he's known for his love of Segways and his generally being a Good Guy in an industry that doesn't always reward that. But I bet what you're really wondering is does this guy have any driving tips? You're in luck, because Mercury News asked the Woz just that. If you're reading this on a Woz-signed Apple IIgs, this will be a special treat. Let's start with the big one. What's Woz' Golden Rule of Driving? Don't offend other drivers. This falls into what I said above. Choose your lane appropriately. The general rule is that slower traffic should stay in the rightmost lanes — in our country. Although we all hate reckless drivers racing and cutting in and out of lanes, I don't want to interfere with motorists who simply want to go faster, even faster than the speed limit. Road conditions are better at some times and they might have somewhere important to get to, like an airport. Assume that other drivers are good like you. We all want to get somewhere. Let everyone in. It's OK to touch your own brake. We all help each other get to where we are going. That's a pretty fitting assessment from a man who didn't want to murder Steve Jobs after learning about that whole Atari Breakout thing. 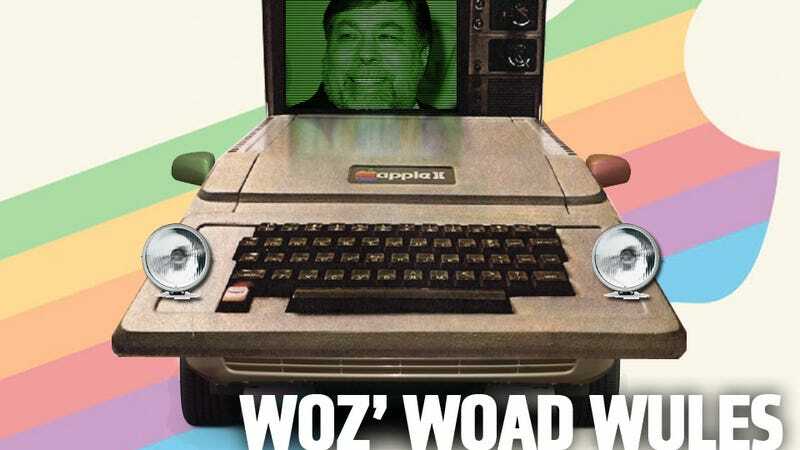 If more people were like Woz on the road, life would be easier. I try to educate Janet from my own learning but she doesn't remember subtle things that one never uses. So one time, to better educate Janet, I pushed the button by the driver's left knee (2009 or earlier models), which disable the keyless entry system, and the ability to start your Prius without putting the key into the ignition. As I drove toward home in my Prius my cellphone rang. It was Janet screaming that I was driving away with her key. I'd just driven her Prius to a parking spot by my own Prius. But now her Prius would not start. I calmly told her that I did not have her key. It took awhile to ask where she'd put her key and to calmly tell her to look there (her purse) and she found it. Then I told her calmly to put it in the ignition. When she got home I showed her the button. She will NEVER forget that lesson. I consider it an example of good teaching. Tough, but effective, I suppose. His car collection ranges from the predictable (four Prii despite his troubles) to the implausible (an original Hummer?) to the hopeful (an unspecified Mercedes-Benz convertible— I'm hoping it's a pagoda). The Hummer may be explained if it's the hydrogen-powered one Woz took to the south pole with his pal, moonwalker Buzz Aldrin. Also, no Black Gold Datsun? Woz also says he's interested in a Tesla Model S, but so far the Priuses have worked just fine for him. I think as Jalops we can totally accept Woz' Prius love, because if there was ever an equivalent in the computer world to a gearhead, this man is it.